I found myself agonizing right along with my Mother through her room difficulties and the heat – I can hear her frustration and discomfort in her actual voice, still clear in my auditory memories. WOW! She out-traveled me in Europe that is for sure. I am so very glad she made that trip. The beautiful, colorful and fragile handmade Italian platters she tenderly cared for during her travels are still proudly displayed in my home and my sister’s. We were stunned that she had gotten them back to us without a crack, because they are much larger than a large dinner plate. Mine is prominently displayed in the kitchen as we speak. I have protected it all these years, through many moves around the country. My Mom was a serious and determined, strong woman most of the time – she had a great sense of humor and a love of all things historical and meaningful but I seldom saw her in awe of anything as I grew up, (except the Rocky Mtns. when we moved from Ohio to Denver) so I wish I had seen her at St. Peter’s, the Sistine Chapel and in Florence when she saw the David and all along the way of this incredible adventure she took. To have all these priceless memories recorded on WordPress for the world to see by my loving and culturally aware, extremely well-traveled daughter is a gift I cannot describe. My daughter must have gotten her wanderlust from her Grandma……love you Kelly. Thanks Mom! So cool that you still have the platter. 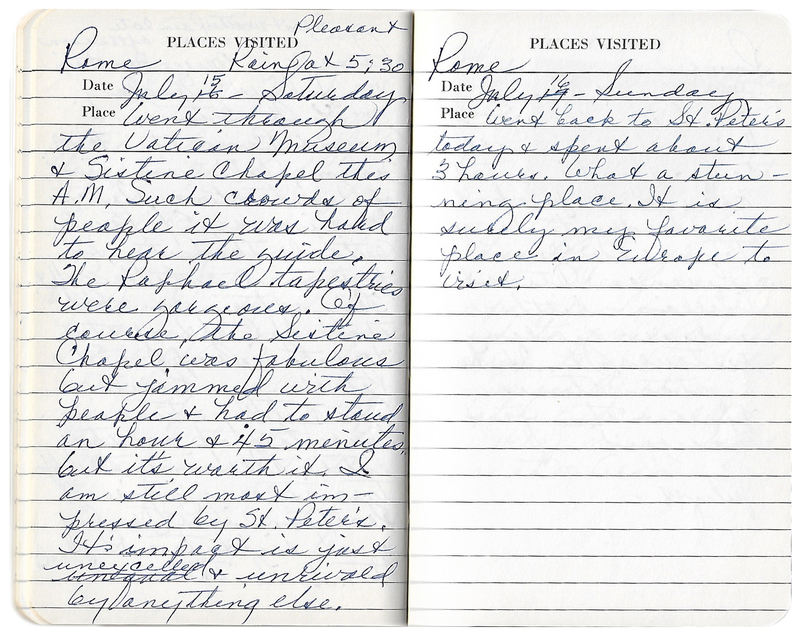 What a great reminder of Grandma’s trip of a lifetime. Very happy to have completed the series and shared her travels with the world. I think she would be flattered, excited, thrilled at knowing her thoughts and steps have been enjoyed by so many. Love you, too! Your travel blogs keep me writing. When my creative spirit and enthusiasm for the craft of writing wanes, when sitting in front of my computer and opening the text file where my unfinished novel lurks feels like torture, when I’m sure there is not any hope of resurrecting the travel story and I want to give up . . . I read and reread your blogs. You are my inspiration. I know the words will come if I’m patient and persistent. You give me not only hope, but also hours of enjoyment. Thank you, Kelly! Marsha! Wow. In all the years of writing this blog, I think your comment has touched my heart the most. I am so completely honored, flattered and happy to know that I’ve inspired someone to keep writing — and especially so because that someone is you. Writing is such a reciprocal, reflective practice — something I didn’t know until I started writing this blog. We must read in order to write, and the blogging community is an incredibly rewarding place for that to happen and flourish. It’s just SO cool to know that my words have created hope and enjoyment for you. Very inspiring. What’s your novel about? Do tell! Great to still be in touch from so many years ago in Truckee! Thanks again for the beautiful thoughts you’ve shared with me. 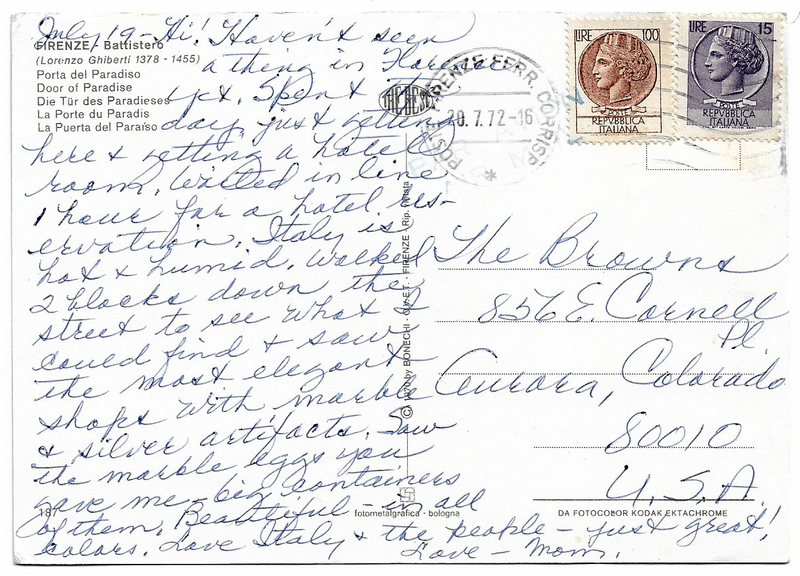 XO, K.
Your grandmother’s postcards were true treasures, but your intros and comments made them all the more poignant. Your mom’s reactions were a very cool addition as well. What a great idea for a series and a wonderful way to link your three generations of strong and thoughtful women! You ladies rock! 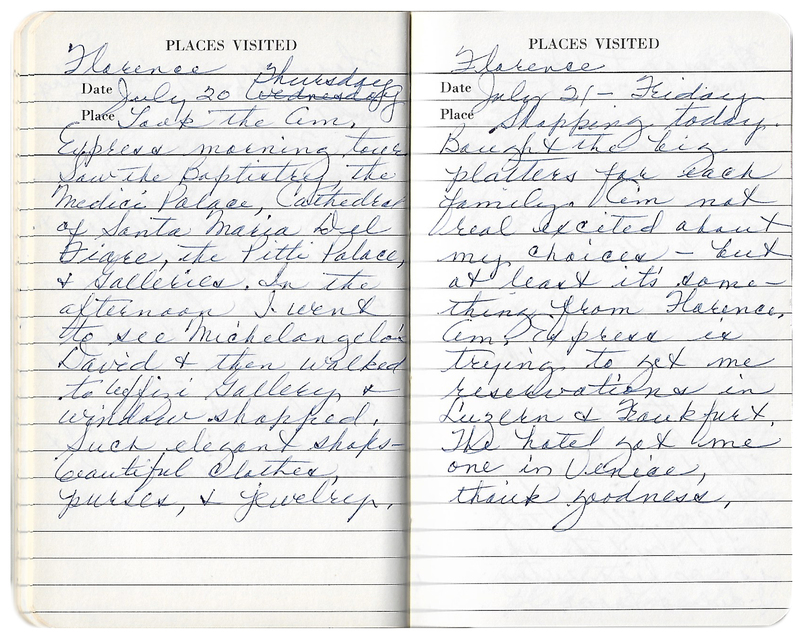 I agree with Lex, your grandmother’s postcards and travel journals really were treasures! Reading this series reminds me of my six-month travel two years ago, with its own ups and downs. It’s amazing to think that in spite of all the technologies we have today, some things about traveling remain the same from almost half a century ago. Such a heartwarming series, Kelly! Thank you so much, Bama. I wish I had more postcards! I’ve had so much fun putting these posts together and reflecting on what they mean to me — and which parts of my grandmother I see in myself. And yes, some things about traveling never change — like summer heat, a good or bad hotel room, and that insatiable thrill of being somewhere foreign. I love most of all that my grandmother embraced the foreignness of Greece and really found the charm in it. Thanks for reading the series! Hope you’re doing well. Oh I just love seeing the three of you all tied together in this grand adventure that your grandmother took. 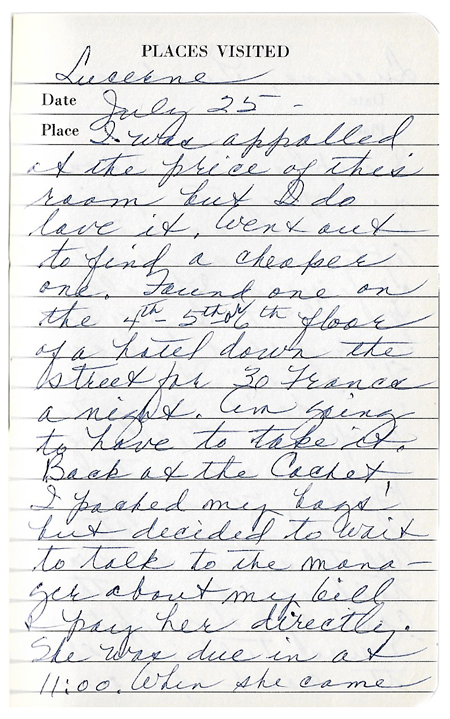 And I can really feel her energy coming through even from these brief notes. Travel weary at the end, but also so engaged with what she was seeing and experiencing. I stayed in youth hostels, travelling a couple of years later, and just showed up. But of course youth hostels would not have been an option for her in those days. They really were only for youth. I think you could be no older than 26, or something like that. I can’t imagine doing what she did. Don and always had a place to stay booked ahead thanks to the internet, which makes travelling so much easier. Thanks, Alison!! So happy you enjoyed these posts. I’ve had such fun writing them and putting them together. I have so many questions now that, sadly, I’ll never be able to ask. But like you, I love my grandmother’s energy and spirit as the trip goes by. She seemed up for pretty much anything that came her way — an open and spontaneous side to her that I never knew and couldn’t have known without traveling with her. So the series has left me with some discoveries myself, which is always a great reward of writing. Thanks again! 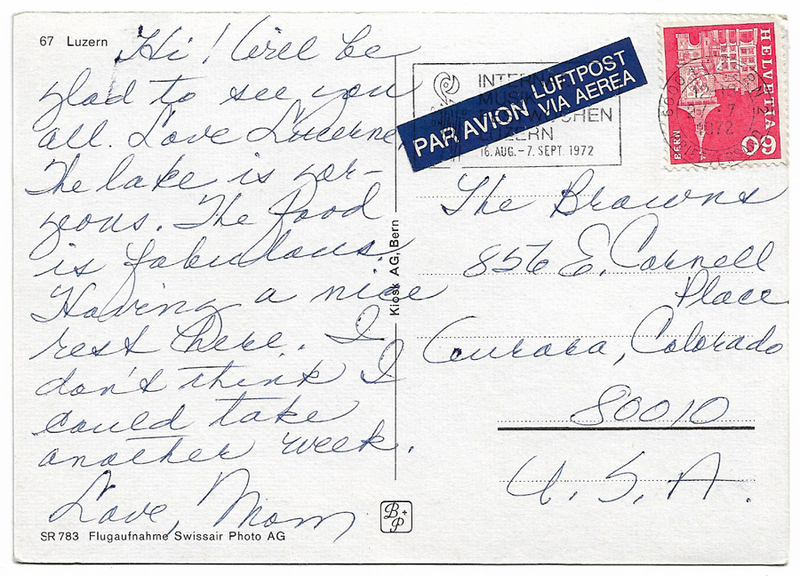 Thank you for sharing your grandmother’s postcards with us. This was a fascinating journey. You’re welcome, Tanja! Thank you so much for reading and coming along for the journey. Wow, that’s amazing! 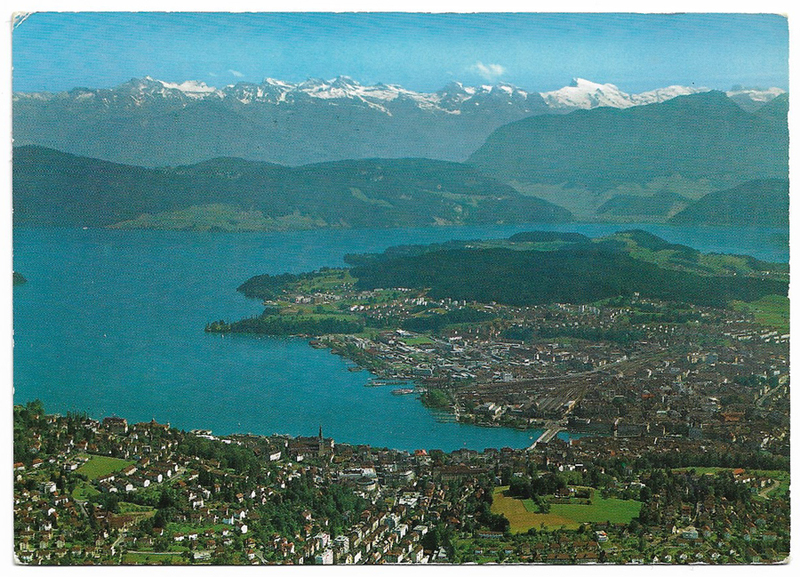 Love that you still have that postcard! Would love to read a post about what it means/meant to you and how it lead to 3,000 more. 🙂 It seems like the novelty and specialness of getting messages in the mail from far away never gets old. And the images on the postcards ignite our imaginations, too. Thank you for reading and sharing your thoughts! An excellent series! 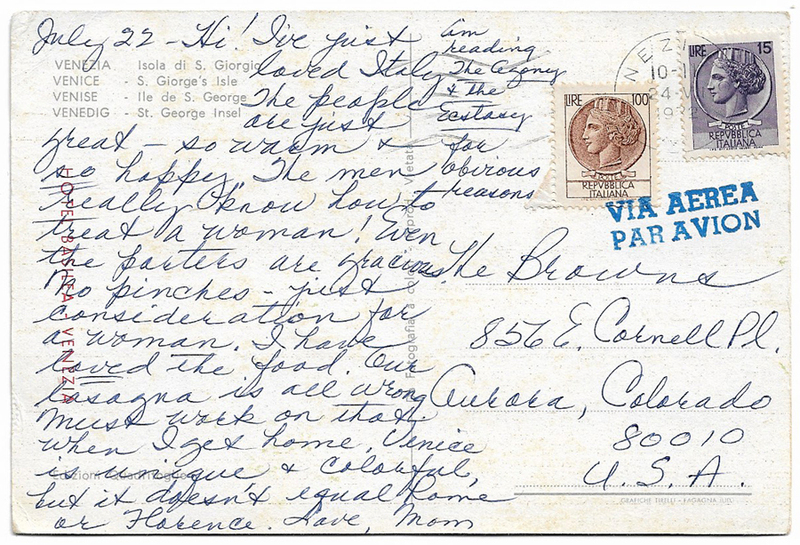 Thank you for sharing the postcards, and your Grandmother’s thoughts about her journeys! Hey Kevin! Thank you so much! I’ve had a blast posting this series and reflecting on her trip. Thank you for reading. She would be thrilled! Oh my gosh, Andrew. What a lovely comment! Thank you very, very much. 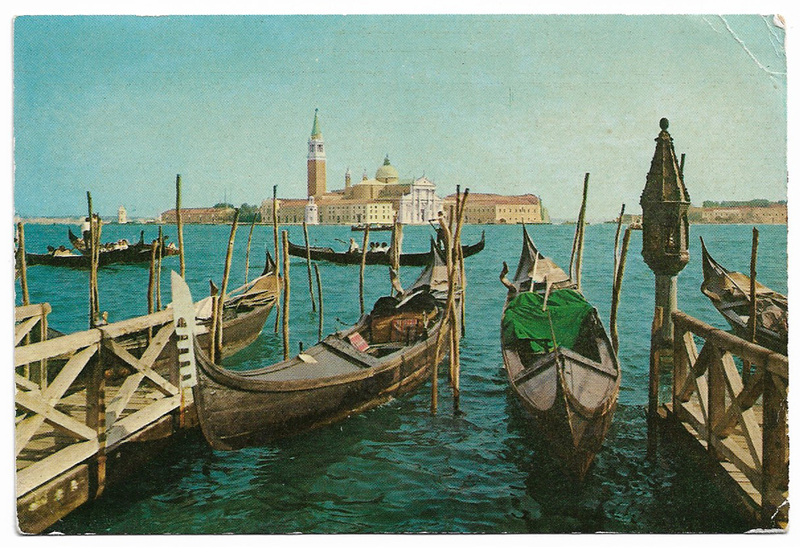 Love that you’ve noticed such a fine “wabi-sabi” detail of the Venice postcard. How many hands must that postcard must have passed through on its journey of thousands of miles! Thanks for the welcome back, too. Summer travel is just about complete so I’m enjoying the calm after the fun. Lots of posts coming up. Hope you’re enjoying today! Thanks again, K.
I love how she writes back, “our lasagna is all wrong.” I had the same thoughts about Italian food after touring Rome, Tuscany, Venice, and Lake Como. Italian food back at home seemed grossly unlike the glorious pastas and simple salads I was devouring in Italy. I went to Rome and Florence in ’85 and was obsessed with Michelangelo for a while after that. The Agony & The Ecstasy was my favourite novel at the time! Thank you for sharing this wonderful series Kelly. Such a beautiful tribute to your remarkable grandmother. Thank you again, Madhu! Great comment. 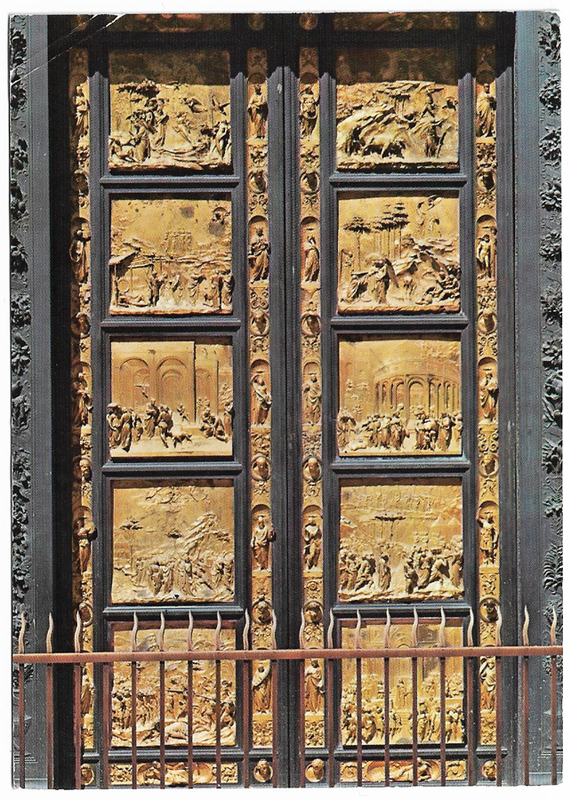 Every traveler I know has been deeply touched by Italy in some way. Such a special place — as all of us, including my grandmother, agree. Thanks for reading this postcard series! 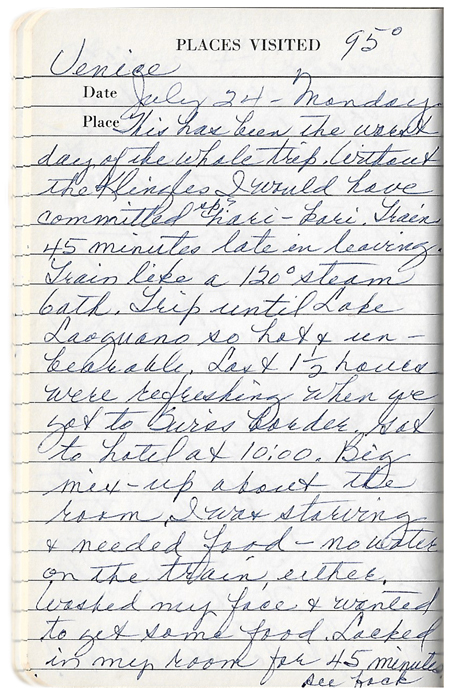 I just love your grandmother’s adventuresome spirit! I can see you in her and also in her insightful comments. Two peas in a pod. How fun! Yvonne! GREAT to hear from you! Thanks so much for your comment and for reading these posts. I’m flattered you see me in the adventuresome spirit of my grandmother. Her postcards and journal entries have shown me a side of her I didn’t know as a young kid — spontaneous, risk-taking and up for whatever came her way. Thanks again for reading and sharing your thoughts! xo, K.
Thank you, Vicki! Happy to hear you enjoyed the postcard series. 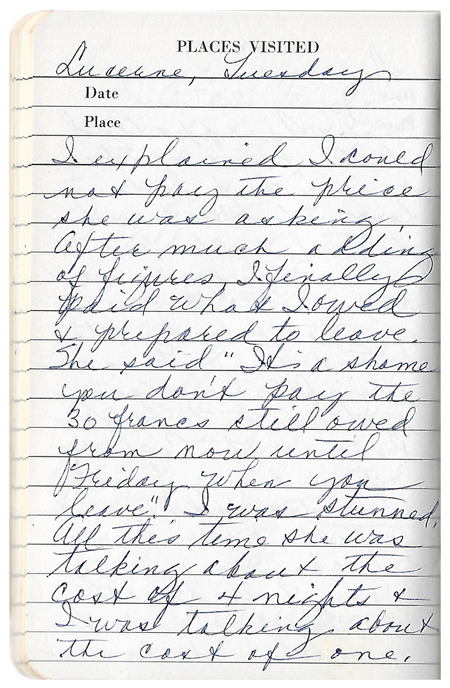 Priceless advice from Grandma to you to keep a journal of your trip! And how great to have it back so many years later! I bet there are some great memories in that journal! 🙂 Thanks again! Hope you’re enjoying the weekend. 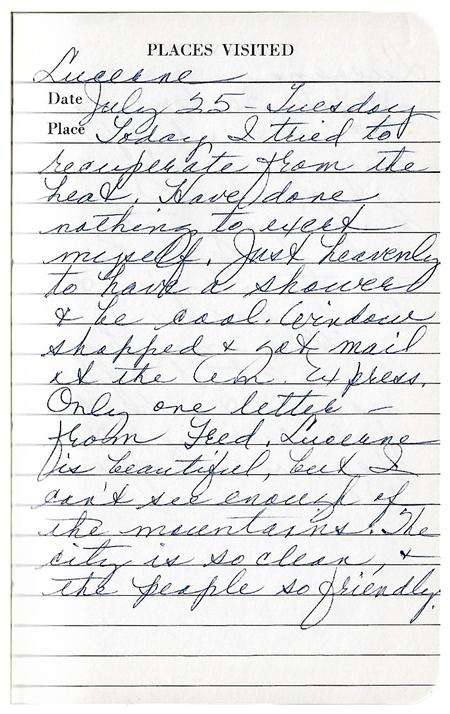 There is nothing better than being able to dive in the past, letters and stories capture the imagination. What a treasure those postcards must be. History is fascinating, but it is made more special when it is a grandparent or ancestor you can learn from, and begin to piece together life then versus life now. 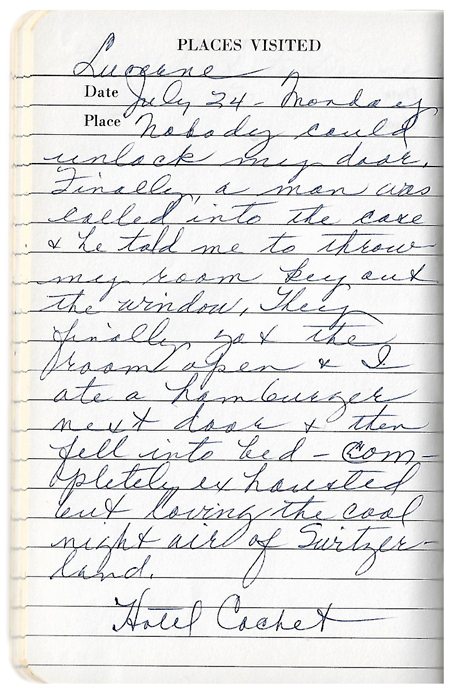 Wonderful writing Kelly, I can see there is a lot of your Grandmother in you. Dalo! I’ve missed you! How’s life? Where are you these days? Thanks for your thoughts about the postcard series. I don’t think I realized how truly adventurous my grandmother was until I put this whole thing together, and that her spirit definitely carries through the family. Thanks so much for stopping by. Hope all’s well in your part of the world. x, K.
The first thought is that I (Ben) remember growing up in France, and in 1972 I was 13 years old. My favorite activity bar none was to go in Paris from the animal market to the stamps and postcard market on the river Seine. 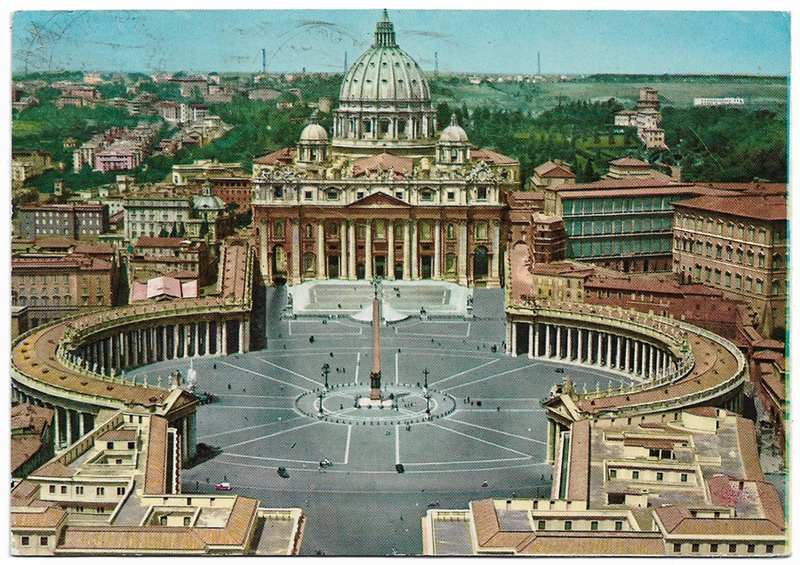 There, collectors would trade postcards from years and decades past. 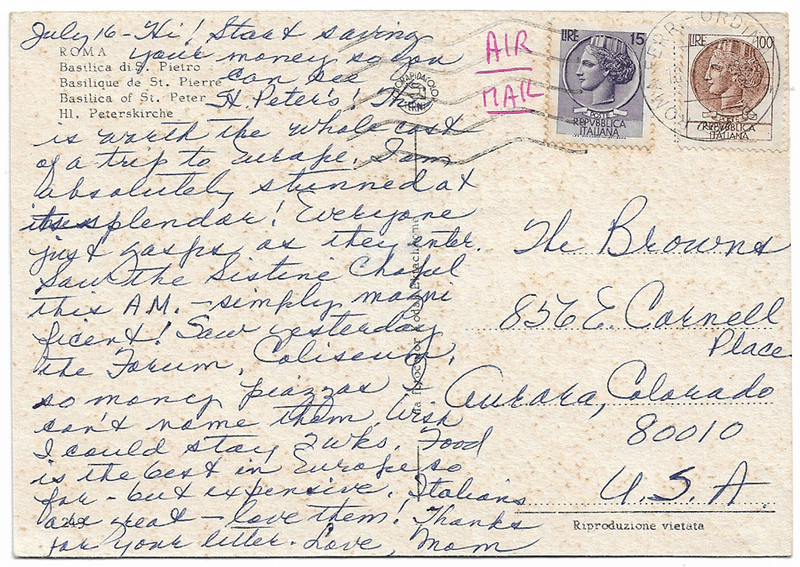 While the connection such as the one you have with your grandmother did not exist, reading through anonymous postcards about travel adventures was a wonderful activity for me as a young boy. Thought number two, is that in the age of hyper digital communication, facebook, emails, instagram and twitter, I wonder how much of that universe of content will be read forty five years from now? It is the nature of the written word on paper that makes it safe guard able, transportable, in a way that digital communication simply will not be because there will be so many technological revolutions over the next forty five years, that any insight or wisdom such as that passed on by your grandmother will likely not survive. There is much to be said for the back of a postcard! What an incredible idea for a series and what a tribute to your grandmother for being a solo adventurer!